Index Holdings recently registered a domain name for Persona 5. While Atlus confirmed that a new Persona was in development back in 2010, the interceding years have seen company stay fairly quiet on the next entry in the popular RPG franchise. Recent revelations, however, could point to future news concerning the status of Persona 5. 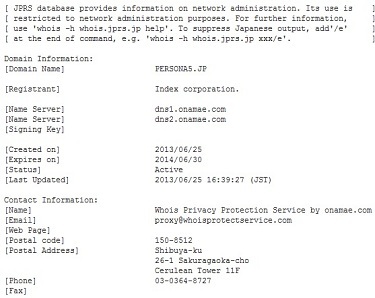 Members of the NeoGAF forum have uncovered a WHOIS registry showing that Atlus's parent company, Index Holdings, has taken control of a domain name for Persona 5 in Japan. While this is in no way a confirmation of anything, it could still be taken as part of preparations by Atlus and Index to ready to the reveal of the series' next game. That being the case, it's worth noting that the domain registration was created on June 25th, mere days before it was discovered that Index Holdings was filing for bankruptcy. Though Atlus has since affirmed that its operations, both in the United States and Japan, won't be affected by Index's misfortunes, it's still hard not to worry given the dizzying pace that changes can occur on the business side of the industry. Worries aside, we can only hope this is indeed an indicator of upcoming Persona 5 news. Persona 3 and 4 are, in the opinions of many, two of the best JRPGs to come out in years, and while there are some who would likely be content to replay them until the end of time, a new game would obviously be welcome.